Ghost Bikes L.A., a local art show honoring a decade of art, advocacy and community opens tonight 7 pm at Red #5 Yellow #7 in the Hel-Mel Bike District in East Hollywood. 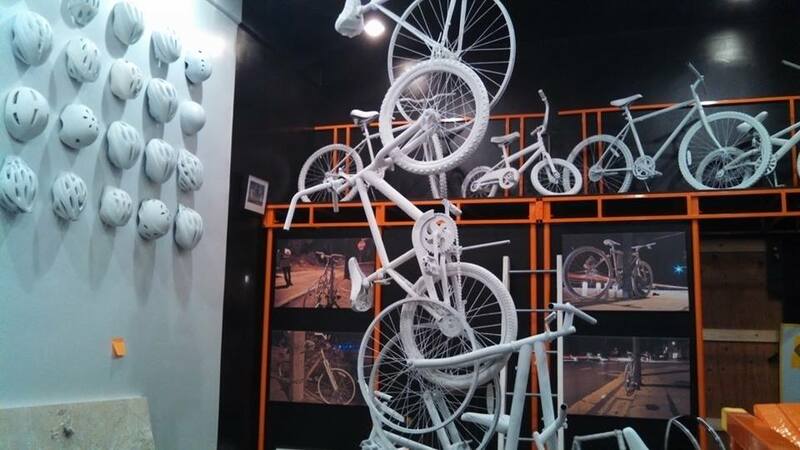 Ghost Bikes are memorials honoring cyclists who are fatally – or sometimes critically – injured due to unnecessary collisions on streets not designed for shared traffic. They are a unique and positive response to a terrible event. By using art, communities around the globe have begun making individual memorials a powerful public awareness tool. Ghost Bikes are not put together by family or friends, but by local bike advocates to pay respect while making it publicly known that a death has occurred and making it obvious that a street or intersection is dangerous. One artist featured in the exhibit is Sahra Sulaiman, one of the editors here at Streetsblog Los Angeles. Her featured work is a photo of cyclist Jose Vasquez lighting a candle for friend Luis “Andy” Garcia. Garcia was killed by a drunk driver as he, Vasquez, and several other cyclists rode home over the L.A. River on Cesar Chavez this past September. “What is so important about ghost bikes is that these hit-and-runs leave families and friends utterly devastated. Not only are their loved ones mowed down, but most are denied any sort of closure because the perpetrators are rarely caught and/or punished appropriately,” Sulaiman writes. The show runs through November 16. For show times and event information, visit the Red #5 Yellow#7 website. Or visit Facebook for event details for tonight’s opening, a session with the families of bicyclists killed in car crashes, and the show closing. That’s exactly what we like to hear. We need people help raise awareness about this. This exhibit will feature prints by Genea Barnes, Sahra Suliman, Kat Jarvis and myself Danny Gamboa. Kat and I have documented Ghost Bikes in SoCal since Feb 2011. We are working on a documentary and will be at the opening tonight. Art Opening: Ghost Bikes of L.A.